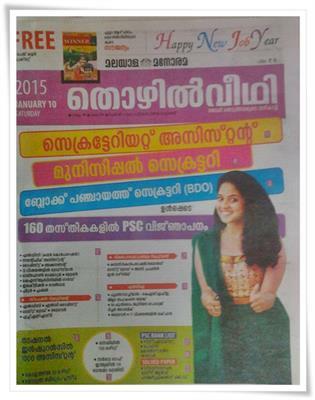 Thozilveedhi, published by Malayalam Manorama is a blessing of millions of job seekers in Kerala. More than an employment newspaper, Thozhilveedhi is considered to be a companion which is ready to serve the youngsters. The 10th January 2015 issue of Thozhilveedhi is thickly packed with new job prospects in both government and private sectors. The latest edition of Thozhilveedhi is comes with jobs in various sectors including job prospects in National Insurance, Cochin Devasam Board, Sree Chitra, Travancore Chemicals Limited, NMDC, ASRB, BHEL, SAIL and Survey of India. Rising vacancies in Sree Chithra and various Universities including Calicut University is reported. Kerala PSC Notifications 2015 (160) including Secretariat Assistant, Municipal Secretary, Block Panchayath Secretary (BDO) and latest PSC Rank List are also featured in this issue. While going through the pages, readers can find latest job opening like 1000 Assistants in National Insurance, 12 in Cochin Devasam Board, 15 Staff Nurses in Sree Chithra, Public Relations Officer in Calicut University, 10 in Travancore Chemicals Limited, 54 in NMDC, 84 in ASRB, 31 Supervisors in BHEL, 783 in SAIL and 118 Topo Trainees in Survey of India. Detailed notifications of 160 PSC exams including Secretariat Assistant, Municipal Secretary, Block Panchayath Secretary (BDO) are included in the lasted edition of Thozhilveedhi. The PSC Rank Lists of HSST Physics and Police Constable Driver, solved paper of Stenographer (Drugs & Pharmaceutical Limited) are also given for reference. Readers can find exam tips for Secretariat Assistant and LP/HSA,DEd & Pre Primary Nursery Teacher provided by Lakshya Academy and Florence Academy respectively. Regular columns including Open Forum, PSC for Beginners, Syllabus of various upcoming Kerala PSC exams and Hall Ticket details are much useful for the PSC aspirants. Questions asked by the readers are answered by PSC officers. The free booklet 'Competitive Winner' in capsule format is accompanied in this issue. The 10 January 2014 edition of Malayala Manorama Thozhilveedhi can provide all the information regarding the upcoming exams and vacancies.